Serbia is preparing to welcome Russian President Vladimir Putin at a critical time for national issues, economy and domestic political situation. The Russian president arrives in Belgrade the day after tomorrow, and Serbia’s political leadership does everything make that visit one to remember. The party organs of the ruling Serb Progressive Party (SNS) and various patriotic organizations are working hard on the Putin host the public gathering to be held in front of St. Savva’s temple in Belgrade, which will be attended by the President of Russia. It is expected that tens of thousands of citizens from all over Serbia will attend the gathering to welcome Putin. This visit, beyond its folkloric dimension has, above all, has a strong political significance. Putin comes to Belgrade at a time when the Kosovo issue is at a critical juncture, when negotiations under the aegis of the EU have been virtually “frozen” and the presence of the US is becoming more pronounced. Washington wants an immediate solution to the issue in order to reduce Russia’s influence in the region, especially in Serbia, as the predominant assessment is that Kosovo keeps Serbia attached to the Russian chariot. On this issue, Putin will not propose a solution but will declare Moscow’s support for any solution that Belgrade will accept. The importance of Russia’s role in this issue is mainly due to the fact that Moscow as a “protector” of Serbia to global organizations can prevent decisions or moves that would be pressing towards Belgrade to accept a solution that it does not want. Putin’s visit is also very interesting in the economic field. Although Russian investments in Serbia are not as large and multidimensional as those from Western countries, it is a fact that investments have focused on strategic sectors, such as energy and infrastructure. What interests Moscow is to be a guarantor of Serbia’s energy security. That is why investments are related to the oil and natural gas sectors. The largest oil company in Serbia (NIS) and the gas company (SrbijaGas) belong to the Russian companies Rosnjeft and GasProm. Russia is currently trying to prevent Serbia from turning to other sources of gas supplies and this will be one of the key goals of Putin’s visit to Belgrade. 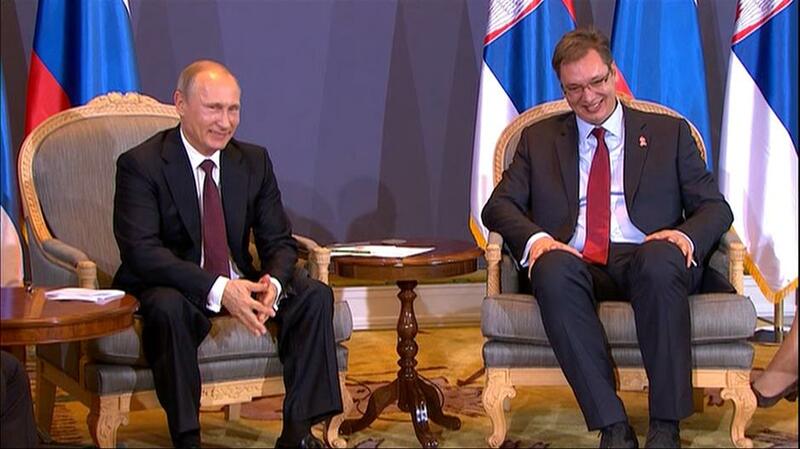 In order to achieve this goal, Putin has a hidden ace, which is to offer a special low-priced regime for Serbia. In an interview with a private television network last night, Serbian President Aleksandar Vucic said that Russian gas is currently cheaper and Serbia’s choice is not to seek interconnection with the TAP or TANAP pipelines promoted by the Western countries. “Some from the West are trying to convince us to take gas from TAP, TANAP or EastMed, just so as not get it from the Russians. […] I do not want to get more expensive gas for political reasons just to put someone on the back, what I want is to get cheaper gas for the citizens. The cheapest natural gas at the moment is the Russian. When the Russians will bring Turkish Stream to our borders with Bulgaria, we will pay them to bring it to us. That’s why Putin’s visit is important”, Vucic said in his interview.